I received the below mentioned complimentary product for free or a discounted rate. Whether or not you agree, All opinions and thoughts are 100% my own. How do you like your bed sheets? Some would say that’s a silly question when in fact it really is one that I now feel is very important as I never really thought about it until now. I recently received the opportunity to review PeachSkinSheets for my 2017 Holiday Gift Guide. I was able to pick the size and color of them. The Original PeachSkinSheets® was founded in 2013 and is based in Atlanta, Georgia. We pride ourselves on being The Original, One and Only Authentic Brand, and our signature peach zipper pull is featured on every sheet package. Our affordable bed sheets are made from a breathable, high performance athletic grade SMART fabric that is great for hot sleepers due to its thermal control and moisture wicking properties. In addition, the ultra soft brushed finish provides a softness level that parallels 1500 thread count cotton but without the shrinkage, wrinkles and pilling. We thrive on being a quality company with a quality product and going the extra mile for our customers. You can find us online, at local pop up events as well as at our retail location in North Point Mall, Alpharetta, Georgia. Once you’ve tried them, we know that you will never sleep on anything other than The Original PeachSkinSheets®! The Original PeachSkinSheets are GREAT for hot sleepers! Breathable, ultra soft, anti-pill and anti-snag bed sheets featuring thermal control and moisture management properties…warm sleepers stay cool, and cool sleepers stay cozy. The durable athletic grade performance SMART fabric wicks away moisture to keep you drier and more comfortable. Best of all, they have a luxurious 1500 Thread Count softness with a brushed PeachSkin finish on both sides. Available in Split King, Cali King, King, Queen, Full, Twin and XL Dorm Twin and XL Dorm Full. I have a ton of medical issues and sleep is what I usually do not get at night. We have done everything from buying new pillows to a new mattress to spraying my pillow with a lilac scent but the aches and pains of Fibromyalgia and Rheumatoid Arthritis still keep me from falling and staying a sleep . One of the major obstacles I also face are hot flashes. Why do they always hit at night? Some sweating but I get really, really hot then really, really cold. The PeachSkinSheets also help me with this problem as they have thermal control which I am in love with! Fiber Never Treated with Pesticides Like Natural, Non-Organic Fabrics. Pet Hair Does Not “Weave” Itself into Fabric, and High Performance Yarns Offer Better Protection Against Claws. I will be the first to admit that I never bought a set of bed sheets for myself. When my Mom was alive she would buy them, I would get them as hand me downs or from a relative who had passed away. Sad, I know. 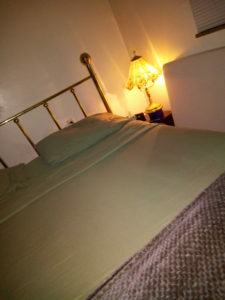 It was not until I received the PeachSkinSheets and my husband and I tried them that I came to the realization that I would never take hand me downs again as they were usually of poor quality. 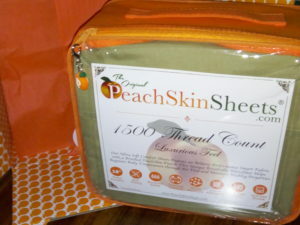 PeachSkinSheets are an incredible 1500 thread count soft. I just don’t get it but these sheets are amazing. The PeachSkinSheets keep me cool when I’m hot and keep me warm when I am cold. They wash up and dry wrinkle free perfectly. The Smart Fabric they use wicks away moisture, is a breathable fabric, anti-pill and anti- slip which means no slipping out of bed. What is there not to love about PeachSkinSheets 18 inch deep pockets and anti-microbial. 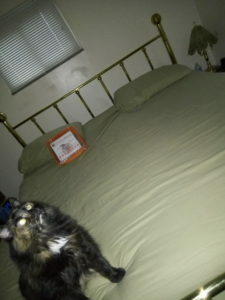 One nights sleep on the PeachSkinSheets was enough to make me sold on them as they always have a monthly sale($55) on their colors of the month. Since we bought this house a little under 2 years ago, I thought I would paint the bedroom an Olive color. That is why I picked Sage Green for my sheets. I am know thinking of painting it a blue/gray but that means I need to order another pair of PeachSkinSheets. They would also make the best a Holiday Gift ever for anyone on you list who has everything or who has nothing. Either way they are perfect. Prices start at $55. They always have 2 Colors of the Month priced at $55 for any size set. Their regular sale price is $79.95 for any size set while Split King/Adjustable Bed specialty sizes are $99.95. 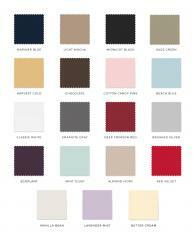 Here is the link to the current Colors of the Month . 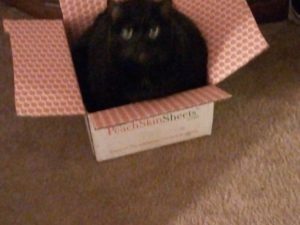 I give PeachSkinSheets my thumbs up and I highly recommend them for yourself or anyone on your Holiday list. Please show our sponsor some love by following/liking them on Facebook and Twitter. 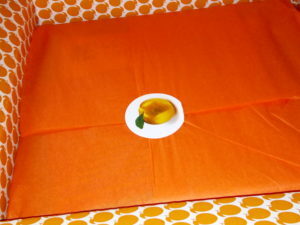 Please check back towards the end of the week for a link to a giveaway where 1 reader will will a set of PeachSkinSheets in their choice of color and size for their very own. 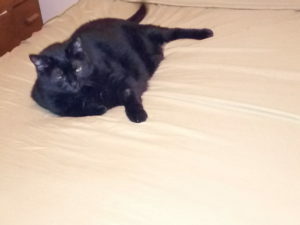 The photos below are some of my pets loving these sheets…..